Is it okay to compare two detached units with two attached units? Is it okay to compare two detached units with two attached units? Or in other words, can we compare a traditional attached duplex with 2 detached houses on one lot? I find sometimes the answer is YES, but other times NO. Let’s consider a few ideas together. I’d love to hear your take in the comments below. Two Units: This sounds basic, but let’s remember an attached duplex (sometimes called a “duet” in other parts of the country) is two units, which is the same number of units as two houses on one lot. This naturally helps us lump both types of properties into a similar pile, though we still have to ask a few questions when it comes to value. 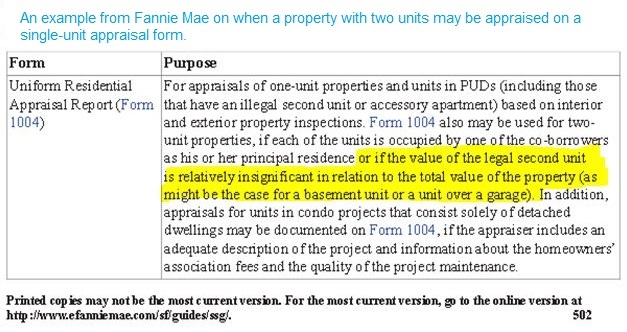 Difference in Rent: One of the questions I ask is whether the attached units and detached units are commanding the same rent (assuming the locations are equal). This could be a clue whether there is a value difference or not. If all units are attracting the same rent and the lot cannot be split, we could be looking at properties with a similar value. On the other hand, if the detached units are commanding higher rents, that might be a clue of a value premium. Of course the only way to discover a value difference is to study the market (this is one reason why there is no such thing as a quick “comp check”). As an example, I recall a “fourplex” where there were four detached tiny single family homes on one lot in Sacramento. While the owner’s property was special, the lot could not be split and the rents were exactly the same as other traditional attached fourplexes. Moreover, the property sold previously on the open market and did not command a price premium during its previous sale, which also helped show there was no value premium for being detached. Lot Split: One of the big issues to consider when making comparisons is whether the lot can be split. If there are two detached homes on one lot, an investor might purchase the property to split the lot and sell the individual properties. I saw this happen recently in Midtown where there were two houses on one lot that were side-by-side on the street. The owner purchased these units a few years ago as a duplex (technically that’s what it is since we are talking about two units), but after the lot was split the owner sold off one unit and kept one for himself. In many cases it’s common to see one house in front and the other in back, so a lot split might not be possible with that set-up (or maybe it is possible, but awkward). However, if the possibility of a lot split exists, it could be worth something in the market, right? The Buyer Pool: There are some duplexes that are best for investors because they simply look and feel like rentals. It’s hard to describe this without sounding pompous, but you probably know what I’m talking about. On the other hand, some multi-unit properties might attract more owner occupant buyers than investors. When this happens, the units might actually command a price premium because of the larger pool of buyers. This underscores the importance of considering who the potential buyer might be and researching the market. What have buyers actually paid for similar properties in the past? What are current listings doing? Conclusion: In short, it is technically okay to compare two attached units with two detached units, but for reasons listed above we ought to be cautious to be sure we are making an “apples to apples” comparison. What I mean is we need to give strong weight to the properties that are most similar and let the market speak to us instead of our assumptions. Questions: Any stories, insight, or ideas to share? Did I miss anything? It has to add value, right? It’s tempting in real estate to make upward adjustments in our valuations whenever we see a feature that is remotely positive. Our thinking is that buyers have to be willing to pay something for that special feature, so we should give it a little value boost. But sometimes making no adjustment is the best thing to do. Let’s look at three quick examples. Duplex with Large Lot Size: We get used to giving value premiums for larger lot sizes for single family homes, but a larger lot size for a duplex is often not a positive gain for the property. Assuming the lot cannot be built on or divided, the extra space really costs more for the owner to manage, and that can actually diminish cash flow for the property. Imagine a duplex on 0.75 acres, while every other similar duplex is on a postage stamp lot. If there is no difference in the rent between all the duplexes, and the larger lot is not useful for building, there probably isn’t a value premium for that extra lot size. In fact, the larger lot may be a nuisance because of the cost of extra landscaping maintenance or even illegal dumping. Location Across from a Park: It’s always worth more to be located across from a park, right? Not necessarily. While a park location might feel like an asset, if it’s also located on a busy street, the negative of the busy location might balance out any positive gain for the park location. Or if a park is known for loitering or criminal activity, it might not be desirable at all to live across the street from it. This is why it is telling to hear home owners talk about their park location. At times they love it and wouldn’t trade it for the world, but other times it’s a clear negative. Of course market value is not just about one owner’s perception, but the entire market. How would most buyers respond to the location? This is where we have to look at neighborhood sales over time to see if there is any price difference between park sales and non-park sales. Condo with a View of a Lake: Imagine a condo with a view of a lake. We would all assume the lake view is worth more than a non-lake view, but what do the neighborhood sales and listings tell us? Is there any price difference at all? If the vast bulk of properties in the condo development are all rentals, and there is no difference in the rental value for the lake view vs. the non-lake view, then the lake view is not an asset. This real life scenario came from a conversation with a mentor recently. The Point: Sometimes it’s tempting to give a positive value adjustment because we feel there simply has to be one. But there actually might not be one. Maybe the market doesn’t behave the way we think it should, or maybe the market in one subdivision trends differently than a nearby subdivision. This underscores the need to watch neighborhood sales and listings closely to try to let the data speak to us rather than let our assumptions trump the data. Marketing to Millennials Event: Locals, I wanted to invite you to an event I’m moderating at the Sacramento Association of Realtors on May 6 at 12pm. It’s called Marketing to Millennials, and it’s all about how to connect with Millennials in your real estate business. This generation too often gets a bad wrap from so many sources, but how can you connect with them and serve them best in business? There will be a guest speaker and four panelists. Make sure to say “hi” if you can make it. Read more here (pdf) or sign up here. Question: What other examples can you think of where a positive value adjustment wasn’t needed (even though it seemed like one should be given)? Part 2 of 3: I sat down recently with Sacramento real estate broker Joel Wright to discuss the 2-4 unit residential-income market in Sacramento. Joel specializes in working with investors and he knows his stuff. We hit on topics such as prices, inventory, rent levels and current trends with duplexes and fourplexes in the Sacramento area. Let me know if you have any questions and check out The Wright Report also for a very detailed analysis of the local market. View Part 1 of this interview series here and watch the new segment below. Here is a graph of all duplex and fourplex sales in Sacramento County over the past three years. What do you see? Does anything stand out to you?